Hosted by Club de Vol a Voile de Quebec, this camp sports terrain which is not overly high but which can support flights of 10,000 feet. Baie St. Paul is a small town on the banks of the St. Lawrence River about one hour and fifteen minutes from Quebec City. To see flights from Baie St. Paul, click here. For more information on this camp, please contact the CVVQ. The Allengheny & Bald Eagle Ridges, affectionately known by glider pilots as "The Ridge", are part of an Appalachian range that stretches with only a few gaps from central Pennsylvania to near Knoxville, Tennessee. This unique formation which provides excellent conditions for ridge soaring but also for thermal and wave flights has yielded many world records in the 70's and 80's. Although the emphasis of world record flights has now shifted to more exotic locations, the Ridge with its easy access from Central Canada continues to be one of North America's premier soaring locations. There is no formal camp at these locations, but pilots from several Canadian clubs located in Southern Ontario frequent this excellent soaring location, including the SOSA Gliding Club, York Soaring, and the Toronto Soaring Club. Flying conditions on the Ridge are best in the spring and fall. Weather forecasts that include thermal activity, winds from 280º - 320º, and 10+ knots of wind are likely to lead to good flying conditions. However, weather conditions can change quickly on the Ridge. Good sources for detailed weather information for the area include Dr. Jack, nullschool, and Windytv. The two most popular airports to launch from to fly the ridge are Ridge Soaring Gliderport and Mifflin Airport. The Ridge Soaring Gliderport is a private-use gliderport. Detailed information about the airport location can be found here. A dual flight is required in order to fly at this location, which can be arranged through renting a club training glider with an experienced instructor. After a check flight in the area, tows can be taken with individual or club gliders. To see flights originating from Ridge Soaring Gliderport, click here. The Mifflin Airport is a public airport, out of which the Mifflin Soaring Association operates. However, outside of competitions, there are no club operations and no gliders are available to rent. Contact the Mifflin Soaring Association directly to arrange a tow. To see flights originating from Mifflin, click here. Both the Ridge Soaring Gliderport and the Mifflin Airport have club houses and bunk beds available to rent, with motels located near the Mifflin Airport. The Cowley airfield is located about 10 kilometres north of the village of Cowley on Highway 3 in the southwest corner of Alberta. This Alberta Soaring Council operated airfield has a long history of being the wave flying capital of Canada. Details of the camps, flying operations, and the flying conditions are available in the Cowley Guide. 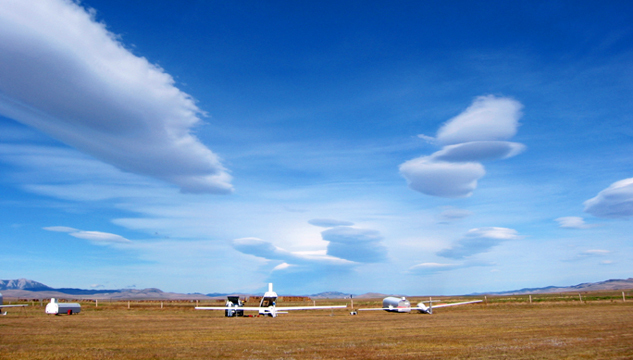 Club members from throughout Alberta participate in this camp including the Cu Nim Gliding Club, the Central Alberta Gliding Club, and the Edmonton Soaring Club. Pilots can arrange to fly one of the many club gliders that are brought down for the duration of the camp, or bring their own glider to fly. A check ride is required to familiarize new pilots with flying in Cowley. Pilots and guests are welcome to camp on the airfield free of charge, with water available but no power. The campground also has a cookshack which is the centre of soaring camp activities. The camps are entirely a voluntary effort, and everyone on hand is expected to help out in some respect such as taking a shift as time-keeper or field manager out on the flightline. Motel and hotel accommodation is also found nearby. For fly-in visitors, there is avgas available at the nearby Pincher Creek airport and emergency avgas is available (in drums) on the airfield. There is a camp registration fee of $15. Tow tickets are $30 for each 2000 feet of tow and a $15 "wimpy" sticker may be added to the ticket for an additional 1000 feet. Oxygen is available on-site. The Alberta Soaring Council runs two major soaring camps at the airfield. The Cowley Summer Camp starts on a Saturday and runs for 10 days ending the Monday of the August long weekend. The Summer Camp is the largest annual soaring event in Canada. Pilots and families are most welcome with free camping at the airfield campground. On a historical average, wave can be expected on 30% of the days. The Cowley Fall Camp starts on a Saturday and runs for 10 days ending the Monday of the Canadian Thanksgiving weekend, which is usually the second weekend of October. At this time of year, this is not a family camping affair except for the hardy – visitors often choose motels in nearby Pincher Creek. The weather is highly variable and at the airfield elevation of 3900 feet prone to freezing at night and a fair chance of the first snowfall of the year. At times the camp has been cancelled at the last minute due to a bad weather forecast, so check ahead by e-mailing the Alberta Soaring Council office before committing to the trip. To see flights originating from the Cowley Camp, click here. For more information, visit the Alberta Soaring Council website. The Lake Placid Wave Camp is held each fall in upstate New York. Lake Placid offers some of the most interesting and varied flying in the northeast: mountain wave, ridge, and local mountain thermal flying are possible at this location. Three Canadian clubs make the annual pilgrimage to Lake Placid each year to enjoy its fabulous wave flying. Pilots typically come from the Montreal Soaring Council, the Gatineau Gliding Club, and the Rideau Valley Soaring, but the camp is open to anyone interested in participating. Pilots can fly one of the many club gliders that are brought down for the duration of the camp, or bring their own glider to fly. A check ride is required to familiarize new pilots with flying at Lake Placid. Rates for flying at Lake Placid are decided directly through the participating gliding clubs. Pilots and guests can arrange to camp directly at the airport, but a full range of accommodation options are available in the area. To see flights originating from the Lake Placid Camp, click here. For additional information on the camp, contact the Montreal Soaring Council.